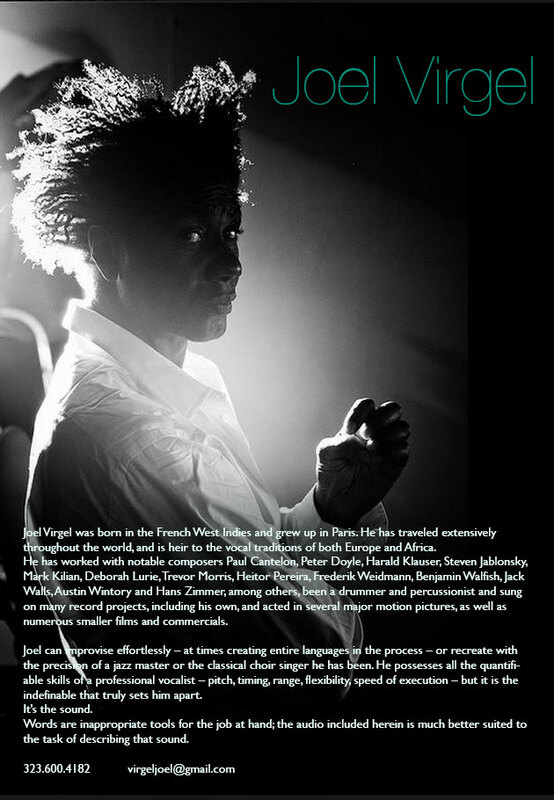 Joel Virgel was born in the French West Indies and grew up in Paris. He has traveled extensively throughout the world, and is heir to the vocal traditions of both Europe and Africa. He has worked with notable composers Paul Cantelon, Peter Doyle, Harald Klauser, Mark Kilian, Deborah Lurie, Heitor Pereira, Frederik Weidmann, Benjamin Walfish, Jack Walls, Austin Wintour and Hans Zimmer, among others, been a drummer and percussionist and sung on many record projects, including his own, and acted in several major motion pictures, as well as numerous smaller films and commercials. Joel can improvise effortlessly – at times creating entire languages in the process – or recreate with the precision of a jazz master or the classical choir singer he has been. He possesses all the quantifiable skills of a professional vocalist – pitch, timing, range, flexibility, speed of execution – but it is the indefinable that truly sets him apart. Words are inappropriate tools for the job at hand; the audio included herein is much better suited to the task of describing that sound.